The following document explains how to create a task or reminder using the iOS Calendar app (iPhone, iPad, or iPod Touch). 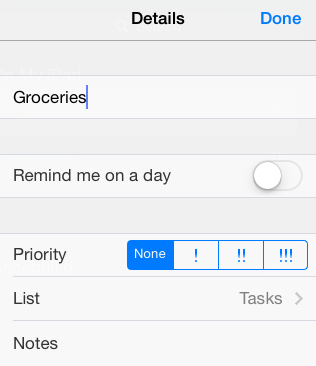 In the iPhone Reminders application, tap New List to create a new list item. If you have more than one Office 365 account configured on your iOS device, you will be prompted to chose the account you'd like this reminder to be associated with. A blinking cursor will appear. Begin typing the title of your reminder. Choose a color for your reminder. Press Done in the top-right corner. Tap under the title of your reminder to add items. Once you start typing, an Information symbol will appear on the right side of the line. Click on that to edit the title, add an alert, change the priority, change the calendar the reminder is associated with (List), or add notes about the reminder. Click Done in the top-right corner when finished.